Steelhead found in San Tomas Aquino Creek. Dinner is served. 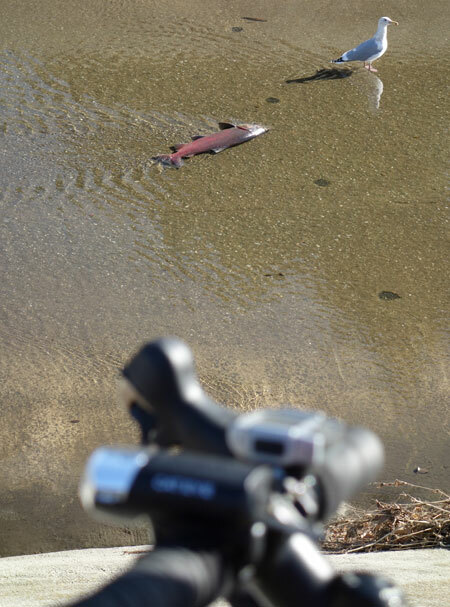 Found today in San Tomas Aquino Creek: one dead Steelhead trout, or salmon. The California gull doesn’t quite know what to do. “A 1985 California Department of Fish and Game (CDFG) survey of Saratoga Creek noted ‘a major steelhead and king salmon spawning area’ on San Tomas Aquino Creek located approximately 200 yards downstream of the Saratoga and San Tomas Aquino creeks confluence.” That’s exactly where I found this fish. Just north of here there’s an artificial waterfall about three feet high. I can’t imagine this fish jumping up, but maybe it did so when we had the heavy rains. On the way back I enjoyed Coyote Creek Trail and then took the newly paved stretch of path along the mighty Guadalupe River. Why oh why didn’t they leave the ramp from Trimble Road onto the trail? Maintenance trucks also use these ramps. There’s a driveway a short distance away but you have to ride the sidewalk. Note that at low points under bridges there is minor path flooding in this area. This entry was posted on December 16, 2012 at 2:35 pm and is filed under Ride reports. You can follow any responses to this entry through the RSS 2.0 feed. You can leave a response, or trackback from your own site.